Next weekend I’ll present a cooking demonstration at Canada’s Table, a day-long celebration of our country’s cookbooks. The choice of what to share for the event took time; in a way, selecting an exemplar for my cooking is choosing a dish that represents me since my work is undeniably informed by my experience and perspective. My father and mother have different culinary traditions, as their families are rooted in south and north India, respectively. I cook the food of their upbringings and their travels, as well as those recipes I collected as a Quebec-born woman raised in Ontario, who married into family with Irish and English beginnings generations ago. As with countless Canadian households, our kitchen is a kaleidoscope of colours that form a single image. The act of sliding out one shard that’s indicative of all influences requires an examination of how and when recipes become repertoire. The first time I ate dal makhani was in Dehradun, Uttarakhand, in northern India, at a reception to honour my grandfather after his passing a few years ago. The dal was dark and thick, almost wooly, with black lentils (specifically whole urad, also known as black gram) punctuating a robust liquid. I wasn’t surprised when mom told me it had been one of grandpa’s favourites. It was going-out dal, luxurious with butter and unwaveringly spiced and credited to Moti Mahal, the storied restaurant. My mother recalls Moti Mahal as the place to go for the fashionable set and dal makhani the thing to eat. Moti Mahal was a small restaurant in Peshawar, which is now part of Pakistan. After partition the owners relocated, reopening in Delhi and it was within their kitchen that tandoor cooking found fame, especially murgh makhani (murgh meaning chicken, makhani meaning butter in Hindi), tandoor naan and dal makhani – the latter sharing its style with the similarly named chicken. Since most of the meals of my childhood trips to India were in family homes, it took until adulthood for me to experience that dal’s indulgent allure. When we returned home from that trip my great-uncle, my grandfather’s brother, shared the Moti Mahal recipe he had saved on an undated newspaper clipping. I make it now and again, each time conjuring that recollection of grandpa along with the gentle reminder of the routines in my kitchen unique to my family. This recipe is loosely based on Moti Mahal’s framework, but biased to my mom’s pantry and palate. The tardka, the final seasoning, is bolstered with tomato paste and purée, adding a subtle sweetness to create a tension with the bright heat of the chilies, both dried and fresh. When in season, use juicy plum tomatoes, cored and chopped to take the place of the purée. Extend the cooking time as required to allow them opportunity to fully slump into delicious mush. The night before you want to eat, cover the dal and beans with water in a large, heavy-bottomed Dutch oven or similar pot. Pop on the lid and leave overnight. The next day, uncover the pot. Stir the lentils and beans, drop in the bay leaf, then bring to a boil over medium-high heat. Lower the heat to maintain a simmer. Cook until everything is tender, periodically skimming and discarding any scum off the surface of the liquid, and stirring now and again. Top up the water as needed. The cooking time will vary, anywhere from 70 to 90 minutes. 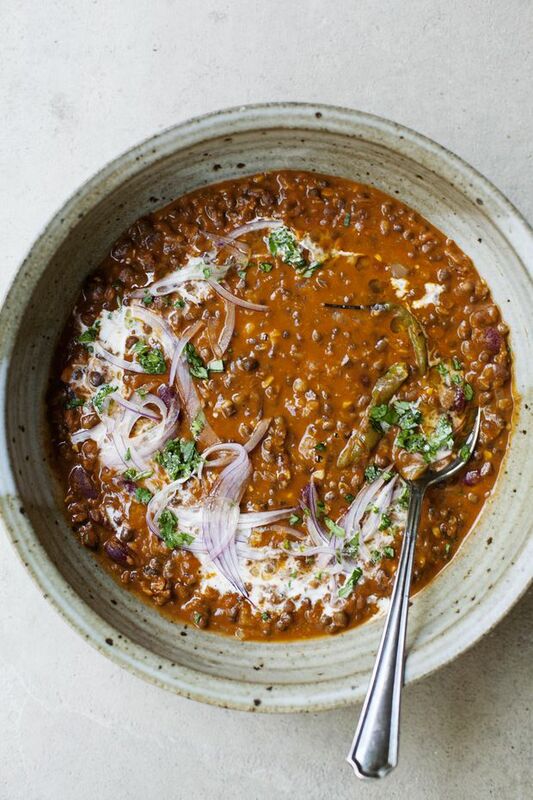 While the dal simmers, prepare the seasonings, or tardka. Melt the ghee in a karahi (an Indian wok) or heavy sauté pan over medium-low heat. Once the ghee is liquid, add the cumin seeds, cloves, cinnamon and cardamom pods and stir until the seeds crackle, about 20 seconds. Tip in the onions and cook, stirring all the while. Once the onions are tender and translucent, maybe 5 minutes, scrape in the garlic and ginger pastes and fry for 30 seconds more, still moving the vegetables around constantly – the aim is for the tardka to develop colour slowly, if at all. Stir in the chilies and chili powder, followed by the turmeric. Finally, add the tomato paste and fry for about 1 minute, so that the paste darkens and dries out. Pour in the tomatoes and leave to bubble until the purée has thickened and looks to split. By this I mean, the ghee will separate and rise to the surface of the liquid. Stir periodically as it cooks, 5 minutes or so more. Decant the tardka into the cooked dal. Stir in 1/2 cup cream. Simmer, partially covered for a few minutes for the flavours to meld. If the dal is too thick at this point, add water to reach your desired consistency. Season dal well with salt. Garnish with chopped cilantro, additional cream if so moved, and lots of fresh lime and onions at the table, along with rice, chapati or naan. Canada’s Table takes place on Oct. 13 at Fort York in Toronto. For more information, visit toronto.ca, and view the Events calendar.